Today is a 5 Things post! I hope you find some topics that are helpful and relatable! Have you heard of a “friendship salad?” (I hadn't). It’s apparently where everyone brings a different ingredient and then you all make a salad. Sounds fun, but my mind immediately skipped over to how this could be done ice cream style…and thus our “friendship ice cream” was born. Each couple (or individual) brought their favorite pint of ice cream and a ton of toppings and then we all made our custom creations. It was easy, super tasty (obviously), and allowed us to get creative in the kitchen without cooking (because it's approximately one thousand degrees in Phoenix still). I also loved that it was a way that everyone could be included no matter what their preferences or dietary needs are, because it's a big bummer to be the odd man out. Ice cream comes in just about every variation now (cashew milk, soy, coconut, etc), and don't even get me started on topping options....we had everything from marshmallow fluff to organic crunchy peanut butter and homemade gluten-free granola, something for everyone! It was a blast and I highly recommend! This week we concluded the Pilot 3 Week Virtual Integrative Nutrition Course and it was SUCH an awesome time with the ladies who attended. We covered ALLLL the things…reviving your physical health, restoring your relationship with your body, and releasing thoughts that no longer serve you. We talked a lot about gut health because it's a key component in the production of hormones, neurons, physical well-being, and emotional health. One tip for a healthy gut is to keep the good bacteria outnumbering the "bad" bacteria. You can do this through a probiotic supplement, or through fermented foods like sauerkraut or (my favorite) kombucha. There are a TON of kombuchas on the market right now, so if you’ve “tried it and hate it” try other brands! I way prefer the ones made with green tea and honey rather than black tea and sugar because they're less acidic tasting. My favorite is Wild Tonic if you’re local to Arizona! ***I’ll be offering this course again in the fall so keep an eye out for that announcement if that interests you! Group courses are a great way to dip your toes in the water if you want a little more but aren’t ready to commit to a full 6 month program. I've been thinking about how it's easier to focus on our expectations rather than to just embrace the full experience. I use to be a big "expectationer" but after having some things that once seemed normal taken away from us for a season, it made us so much more aware of the delight of simply experiencing things. Maybe you've broken a bone and couldn't use it for a while, or a loved one moved away, or you've experienced isolating mental or emotional pain, or your physical body was in a prolonged time of illness and recovery. Once the season starts to shift, everything feels so full of wonder doesn't it?? On this particular night we tried a plant-based restaurant called Green in Downtown Phoenix. The food was good, but that's not what made the night special...at all. What made it special was getting way over-dressed for a casual restaurant, sitting outside in the heat just so we could be under the sky, and tasting things that we hadn’t ever had before. We'll always find beauty if we choose to experience things through a lens of gratitude and curiosity, but when rooted in expectation, we'll likely be left longing. May we choose to stay curious and not calculated. I posted this quote to my coaching IG a couple weeks ago and wanted to share it here because I think we all need the reminder sometimes. 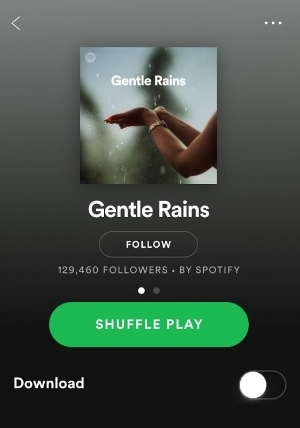 After I finish a work-out or stretch, I’ve been laying on the floor and listening to the "Gentle Rains" playlist on Spotify for 10 minutes. It feels like an invitation to totally relax and just be soaked in goodness. There’s something about nature sounds that are so comforting. That's a wrap! What have you been loving, listening to, or eating lately? Share with us in the comments below!